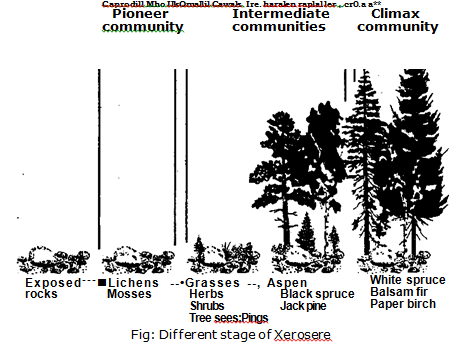 The succession occur in dry condition is called Xerosere (xerarch ) . It undergoes following stages. Crustose are land lifeless structure. The crustose may have an external protective layer surface on the rock. Special types of lichens can grow on ,these rocks. The lichens are called crustose lichens. Its most common species are Rhizocorpon. Rthodina and Lea117(1M. These lichens can live in extreme conditions. Sometime, their surface becomes wet due to rain and dew-drops. They absorb water during dry season. They cause weathering of the rock. They prepare the land for next stage. Now habitat is suitable for foliage lichens. Foliage lichens are leaf like. They are attached at one point.. Their examples are Parmelia and Dermaticarpo. They produce shade on the crustose lichens. As a result the growth of crustose lichen is reduced or decreased. They make the soil acidic. Humus is added to it. It makes the rock rough. The soil has a large amount of humus and litter. Thus its water holding capacity is increased. Thus -there is wire availability of moistures, humus and soil for anchorage.The herbaceous plants are now established there. These plants increase the process of weathering. Evaporation or transpiration takes place. It reduces the temperature. Now bacteria, fungi and other animals establish there. Some xerophytes grasses also establish there. Soil conditions are now becomes favourable for shrubs. Shrubby plants now start growing. They become dense. They cast shadow on herbs so the herbs die. Thus the herbaceous plants add more humus to the soil. The roots of shrubs penetrate into soil. They develop wide cracks in rock. The process of soil formation continues. The soil is much improved now. So it now allows the growth and establishment of woody plants. These plants are densely rooted. The shade of these plants inhibits the growth of most plants. Woody plants dominate in this stage. This stage essentially remains the same if nothing changes in the environment to upset the balance. It is a stable stage in succession. Thus the woody forest is the climax stage for this region.